Photochemical and Photobiological Sciences (PPS) is a highly cited and internationally leading journal in the multidisciplinary field of Photobiology. In this area, articles and perspectives are highlighted which have either been highly cited or which are recognised as especially novel steps forward in the science of photobiology. The highlights will also be located initially on the RSC ‘s blog for PPS where free access to the original article will be available for 4 weeks after posting. The step-up photophobic response of the heterotrich ciliate Blepharisma japonicum is mediated by a hypericinic pigment, blepharismin, which is not present in any of the known six families of photoreceptors, namely rhodopsins, phytochromes, xanthopsins, cryptochromes, phototropins, and BLUF proteins. Upon irradiation, native cells become light-adapted (blue) by converting blepharismin into the photochemically stable oxyblepharismin (OxyBP). So far, OxyBP has been investigated mainly from a photophysical point of view in vitro, either alone or complexed with proteins. In this work, we exploit the vivid fluorescence of OxyBP to characterize its lifetime emission in blue B. Japonicum cells, on account of the recognized role of the fluorescence lifetime to provide physicochemical insights into the fluorophore environment at the nanoscale. In a biological context, OxyBP modifies its emission lifetime as compared to isotropic media. 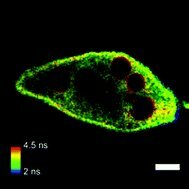 The phasor approach to fluorescence lifetime microscopy in confocal mode highlights that fluorescence originates from two excited states, whose relative balance changes throughout the cell body. Additionally, Cilia and kinetids, i.e., the organelles involved in photomovement, display lifetime asymmetry between the anterior and posterior part of the cell. From these data, some hypotheses on the phototransduction mechanism are proposed. Formulation by amphiphilic copolymers, e.g. nonionic Pluronics®, that spontaneously form nanoparticulate micellar carriers (10-100 nm) in aqueous media is one possible strategy to solubilize lipophilic photosensitizers and improve bioavailability, as investigated in this paper by in vitro cellular studies. Pluronics consist of hydrophilic poly-ethylene oxide (EO) and hydrophobic poly-propylene oxide (PO) blocks arranged in a sequential manner (Figure 1). Pluronics form micelles with a hydrophobic core and hydrophilic corona when individual polymer chains spontaneously assemble into nanosized aggregates above a certain concentration (critical micelle concentration, cmc) and temperature (critical micelle temperature, cmt). The self-assembly of amphiphilic polymers is a reversible process. However, owing to a prolonged in vivo circulation time prior to dissociation, a high solubilizing capability and low toxicity, several Pluronics are approved for oral or intravenous administration, e.g. by the US Food and Drug Administration. The Pluronic block composition will influence polymeric lipophilicity, micellar aggregation number, shape and size, cmc and cmt values, drug loading and localization, and the release of drug from the formulation. A proper selection of the polymeric blocks may enable development of optimized drug formulations with enhanced accumulation of the selected photosensitizer in cancer cells, as studied in this paper by formulation of the highly lipophilic photosensitizer Curcumin with selected Pluronics. The field of pluronics has excited much interest lately, not least for the potential of these interesting polymers to assist in targeting cancer calls. The paper described above is an excellent example of how “pluronics” can be applied to improve targeting of photosensitisers in to cells and was one of the most accessed PPS articles on the Royal Society of Chemistry’s website last year. Under the terms of the Montreal Protocol on protection of the ozone layer, regular assessments of the state of knowledge in this area are required by the signatory parties. The paper “Ozone depletion and climate change: impacts on UV radiation” by McKenzie and co-workers is part of one such assessment which was provided to the United Nations Environmental Panel (UNEP) through their Environmental Effects Assessment Panel (EEAP). The EEAP reports on the Environmental Impacts of Ozone Depletion and, in their more recent assessment, have been asked to comment on any interactions between ozone depletion and the climate change. In an attempt to make these assessments more accessible to the wider scientific community, they are also published in the peer reviewed scientific literature. Both the last two major assessments (2006 and 2010) and several interim reports of the EEAP have been published in Photochemical & Photobiological Sciences. The paper by McKenzie et al. is essentially the first chapter of the most recent full assessment in 2010. That chapter assesses our progress towards understanding atmospheric research relevant to the effects of ozone depletion and climate change on solar UV radiation. It provides a link between (a) the more detailed and technical WMO/UNEP report on the Science of Ozone Depletion, and (b) the subsequent chapters of the EEAP assessment that report on the environmental effects on human health, the terrestrial environment, the aquatic environment, biogeochemical cycles, air quality, and material damage. These latter chapters are also published in the same special issue of Photochemical and Photobiological Sciences. Although not designed as a review, the chapter nevertheless provides a digestible short summary of important research results on the subjects of ozone depletion, UV radiation, and interactions between these issues and climate change that have appeared in the literature in the four years since the previous assessment. Therefore, in addition to the primary purpose of providing an assessment for policymakers, the article also provides a useful introduction to the subject, especially for researchers new to the field and to educators. The scope is unique, as it provides a one-stop update of these diverse, yet interrelated issues. It is written in a style that makes it accessible to the general public without detailed knowledge of the issues. As the topic is of wide interest to the scientific community, this 2011 article published in Photochemical and Photobiological Sciences is one of the most highly cited in the journal from recent years. The 2014 assessment is currently under review, and will be published in a special issue of Photochemical and Photobiological Sciences in early 2015. UVB is the portion of the solar spectrum that is absorbed by DNA. It is a major contributor to the biological effect of sunlight, a property that has been known since the early 19th century. The genotoxic effects of UVA have attracted comparatively little interest however research into this portion of the solar spectrum has been revisited in the last twenty years. There has been an intense effort to understand how UVA radiation damages DNA, induces mutations and is involved in human skin carcinogenesis. A classic Photochemical & Photobiological Sciences Perspective by Sage and co-workers summarizes the main results of such investigations. The article highlights unresolved issues in the field and discusses the more controversial data in the recent literature. In particular, the authors summarise the evidence that the formation of cyclobutane pyrimidine dimers, the major DNA damage induced by UVA in mammalian cells, is caused by direct DNA-absorption of UVA photons rather than photosensitized reactions. This research is of particularly great importance for considering approaches to photoprotection. Although contradictory data on UVA mutagenesis has been reported in the literature, the authors offer a critical analysis of the key findings and conclude that the main mutations induced by UVA are C to T transitions at bipyrimidine sites – the same process as for UVB. 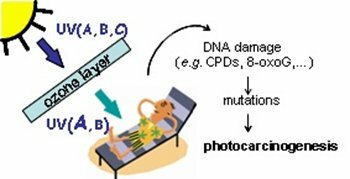 The authors propose that such a mutational specificity is a general UV signature, regardless of whether the UV radiation in question is UVB or UVA. This raises the question of what are the causative wavelengths when such mutations are observed in skin tumours. The review also presents new insights on the genotoxic effects of UVA and provides a better understanding of the relative contribution of UVA to skin carcinogenesis, a crucial issue considering exposure of the human population to UVA radiation is unavoidable. The review presents mechanistic arguments that complement epidemiological studies on the risk of melanoma associated with the use of tanning beds, which emit over 99% UVA, and provides a platform for raising new questions on the potential effects of UVA radiation. Since its publication in 2012, the Perspective has attracted considerable attention from researchers in the field, as evidenced by a growing number of citations. 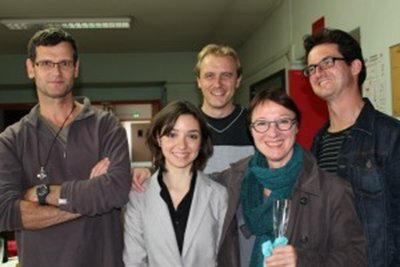 Pierre-Marie Girard (CNRS researcher), Angela Bellini (PhD student) and Ev Sage. Sylvain Martineau (engineer), Ludovic Tessier (technician).